Kenya’s capital, Nairobi, is a city full of contrasts. 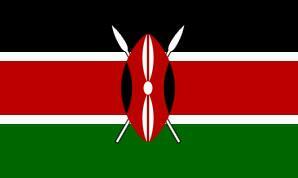 It’s old enough to feel its past and multi-ethnic enough to experience the rich Kenyan culture. With a population of nearly four million, the city blends people from all cultures and walks of life. Nairobi has a good selection of properties to suit all budgets and requirements; here’s a small sampling along with some suggested spots for activities and shopping! For convenience, if you are arriving late or need to be at the airport, the Crowne Plaza hotel (formerly Lazizi) is a good bet. I had several hours between finishing my touring and a late international flight so booked a day room, where I was able to freshen up, repack after my retail therapy and have a bite to eat before heading to the terminals to check in. The staff are friendly, the food was good and the rooms are clean and pleasantly furnished. The airport shuttle runs to and from the hotel every 30 minutes. 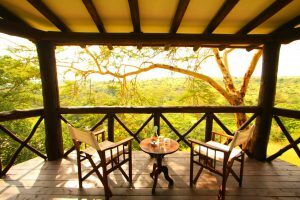 If you are staying a couple of nights in Nairobi, and want an early jump on your safari experience, there are two properties which border the Nairobi National Park. The Emakoko is a beautiful lodge with 10 rooms, in the warm welcoming colors of Africa, with indoor and outdoor space, nestled on a hillside overlooking the park and a small river. It’s hard to believe that the international airport is only 30 minutes away, as the sense of tranquility is palpable. You can enjoy some early game drives in the park – there’s a healthy population of black rhino, plains game and lion not to mention the lodge’s feline “neighbors” – a leopard duo who make their presence known from time to time. Their new 2-bedroom villa is perfect for families with a separate kitchen, dining area and pool. Ololo Safari Lodge, also located on the edge of the park, is a former private home, built in classic African style with thatched roof, and another beautiful setting in which to adjust to African time. It offers a variety of room styles, from the classic main house Terrace Room, overlooking the park, to tented rooms or, for families, the Stable Cottage, a 3-bedroom house at the rear of the property. The owners are passionate about style and design, which is reflected in the décor – they actually create some of the wood furnishings in a studio on the property. I hope that they sell the lamps in a shop eventually! If your preference is to be closer to the (non-wildlife) action, consider two very different properties in the Karen area of Nairobi. 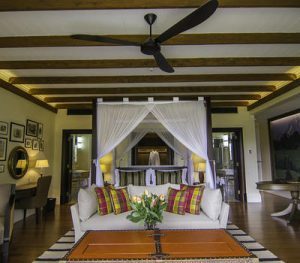 Hemingways is a stunning property, featuring 45 spacious suites, with views towards Karen Blixen’s famed Ngong Hills. The main area of the hotel leads out to a terraced lawn, and the services are stellar – you are assigned a butler to assist with any request, can enjoy the spa and pool area or cocktails and dining as the sun sets on a busy day of adventure. I enjoyed my very first Dawa cocktail, a Kenyan classic, simply made of vodka, honey, lime juice and crushed ice and sure to be a favorite for many! A smaller, charming alternative is One Forty Eight, perfectly situated close to the Giraffe Center, on a quiet residential property. Formerly a private home, the 10 rooms are located both in the main house and in a separate studio building. The rooms feature incredible artwork by some of Kenya’s finest artists. With cosy sofas and chairs, the public areas are a great spot to congregate at the end of a long day of touring or shopping though you can indulge in some serious retail therapy right on the grounds as one of Kenya’s most famous designers, Anna Trzebinski, has a design studio and shop on the property. Speaking of shopping, here are a few additional retail suggestions – if you shop at the beginning of the trip, African Portfolio can advise on luggage storage! Utamaduni Shops: A wonderful selection of artisan craft shops featuring a variety of African products, crafts and art. Langata Links: A mix of traditional and modern goods from children’s wear to handbags to beauty products! 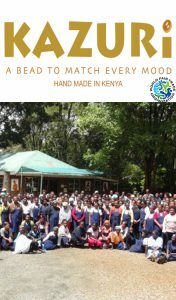 Kazuri Beads: Kazuri, meaning “small and beautiful” in Swahili, is both a factory and a shop, making handcrafted jewelry based on clay beads. I learned how the beads are made on a tour of the factory and the attention to detail the ladies put into the final product is truly impressive! David Sheldrick Wildlife Trust – the Trust is still mourning the loss of their beloved founder, Dame Daphne Sheldrick, in April 2018. A passionate supporter of wildlife conservation and a pioneer in creating a “formula” to help elephant orphans thrive after mourning the loss of their family units, Dame Daphne founded the Trust in the late 1970’s. 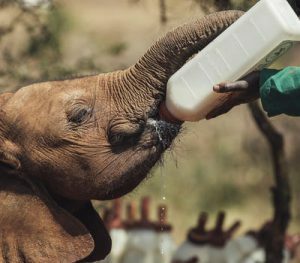 Visitors can attend the public opening at 11am to watch the orphans be fed and enjoy their mud baths while learning the history of each orphan, where it was found and how the orphans will eventually be reintroduced into the wild. Additionally, visitors can visit the website and foster their own elephant for $50/year, something I chose to do, which allowed me to visit the Trust by appointment at 5pm, watch the elephants go through their bedtime routine and meet my foster elephant. Kiambethu Tea Plantation – within an hour’s drive, enjoy a visit to the Kiambethu tea plantation. Learn about the process, see the tea growing in the field and, of course, partake of the final product. Additionally, you can enjoy a guided walk in the indigenous forest before lunch. For even more great tips, please read our previous post on Nairobi here, or contact us to discuss how to incorporate the city into your East African itinerary.